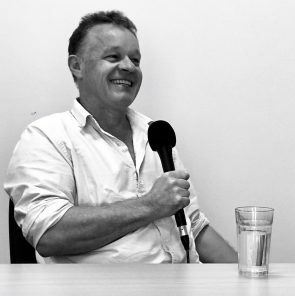 Reading Australia presents this Graeme Base podcast, with permission from The Garret Podcast. Graeme Base is a legendary British-Australian writer and illustrator. Generations of children have grown up enthralled by his creations, including Animalia (awarded the Children Book Council’s Picture Book of the Year Honour Book in 1987) and The Eleventh Hour (awarded the same prize in 1989). His other works include Grandma Lived in Gooligulch (1983), The Sign of the Seahorse (1992), The Discovery of Dragons (1996), The Waterhole (2001), Truck Dogs (2003), Jungle Drums (2004), Uno’s Garden (2006), The Discovery of Dragons: New Research Revealed (2007), Enigma (2008), The Legend of the Golden Snail (2010), The Jewel Fish of Karnak (2011), Little Elephants (2012), The Last King of Angkor Wat (2014) Eye to Eye (2015) and Amazing monster Detectorscope (2017). Graeme also illustrated Lewis Carroll’s Jabberwocky (1987) and Jabberwocky: A Book of Brillig Dioramas (1996). Graeme Base is one of the world’s leading creators of picture books. His alphabet book Animalia, received international acclaim when it was first published in 1986, and has achieved classic status with worldwide sales approaching three million copies. It has now inspired an animated TV series. Other favourites by Graeme Base include The Eleventh Hour, My Grandma Lived in Gooligulch, The Sign of the Seahorse, The Discovery of Dragons, The Worst Band in the Universe,The Waterhole (and The Waterhole Board Book), Jungle Drums and Uno’s Garden. In 2007 this last title featured in six major awards and was winner of three: Speech Pathology Book of the Year, younger readers; The Green Earth Book, USA; The Wilderness Society Environment Award. In 2003, his first novel for young readers, TruckDogs, was released. It was shortlisted for the Children’s Book Council of Australia Book of the Year Awards the following year. In 2009 Graeme produced the the fascinating, beautiful and challenging book Enigma; can you crack the code? Graeme’s most recent book is The Last King of Angkor Wat. Graeme lives in Melbourne with his artist wife, Robyn, and their three children – James, Kate and Will.